Welcome to Our State of the Art Gym - Capital Area Speech & O.T. 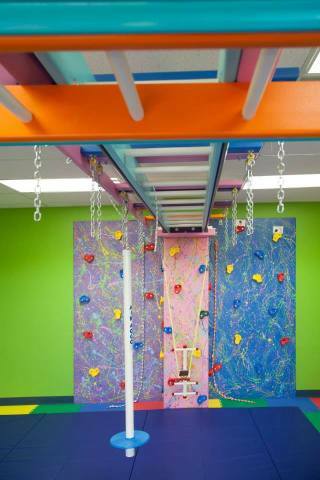 We are extremely excited about our new sensory gym. It is big, bright, and full of fun equipment! What’s not to love? However, you might be wondering how all of this will help a child develop skills. In therapy, we use the gym equipment to improve the fundamental skills that children need to be successful in their everyday lives. With a little bit of creativity, we can use the same activity to address many, many skill areas! Swings: With so many swings to choose from, the therapeutic possibilities are endless! The movement of the swing provides input to the vestibular system, which can be calming or alerting, depending on the child. This can help your child to focus on fine motor activities during therapy. The swings can also be used to build upper body and core strength, improve balance skills, and encourage your child to use both sides of the body in a coordinated manner. Slide: Like the swings, the slide is wonderful for providing vestibular input. It can also be helpful for children with a fear of heights. Sometimes, we like to change things a little and climb up the slide! This is great for improving full body strength and coordination. Monkey bars and rings: The monkey bars and rings are great for building upper body strength, endurance, and coordination which are very important skills for fine motor and handwriting development. By having a child pull up their legs while hanging from the bars (to kick over objects, for example) we can also address core strength and, as a result, improve balance and posture. Zip line: Like the monkey bars, the zip line is awesome for building strength and endurance in the upper body and core. It also helps us teach children to be aware of and regulate their strength and speed. Rock wall: The rock wall is perfect for working the entire body at the one time! It also requires your child to think about their end goal and create a plan to achieve it. This really exercises their sequencing and problem solving skills. Obstacle Courses: By combining several pieces of gym equipment we can create an obstacle course that works on a ton of skills at once! Obstacle courses are also great for teaching your child to plan and sequence motor activities. Participating in this type of activity can really improve your child’s self-esteem and enable them to approach new activities with confidence! 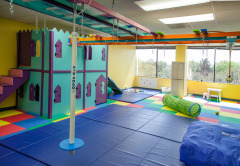 These are just a few of the ways that our sensory gym can benefit your child. We look forward to helping them learn and grow, all while having a blast! Call to schedule an appointment to see if your child may benefit from these services. We look forward to talking to you!